The Greatest Film Franchises of All-Time: In general terms, film franchises are multi-picture stories, often including some of the same characters from film to film. Although film series have been around for many decades (e.g., the Tarzan films, the Sherlock Holmes films), film franchises really became a major cinematic fact of life since the 1970s, beginning with the Planet of the Apes series, the James Bond series-franchise and then the Star Wars films. The corporate mentality, that began to look on films as "products," thereby named a series of films as "franchises." Franchises have become even more important than individual stars. They consist of connected universes (Marvel's Cinematic Universe, Middle Earth, and the DC Extended Universe), lots of spin-offs (reboots and remakes), and many sequels (or prequels). 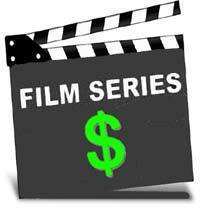 Most of the major franchises that are profitable have at least three films and have made over $450 million (domestic). Some of the more recent franchises have been derived from films going way back, such as Superman, Star Wars, Planet of the Apes, Alien, and James Bond. in terms of genre popularity, fantasy/adventure, horror and sci-fi films fare the best as crowd-pleasing franchises (with generous doses of action, violence and PG-rated content), featuring big-name stars and big budget production values. With the continued release of new films in many of the top franchises-series, it's difficult to say when any one franchise attains # 1 status in terms of its box-office totals, although recent data now confirms that the Marvel Cinematic Universe franchise has overtaken the Harry Potter franchise as the most commercially-successful (domestic) movie franchise of all-time, beating even Star Wars and James Bond, although the Pixar-Disney animations (if they can be counted as a franchise) have very significant totals. In terms of inflation-adjusted (domestic) totals, the order of top franchises changes, beginning with Star Wars, followed by James Bond, Marvel's Cinematic Universe, and Harry Potter. Recently, the trend in movie-making has been away from franchise sequels (with numbers in the film title) to "origin stories" or reboots of the original, such as Batman Begins (2005) or Star Trek (2009) - including some with original titles, such as X-Men Origins: Wolverine (2009) or Terminator Salvation (2009). Although it has been expected that a series of franchise films will secure box-office success, not all successful first films have generated profitable sequels (with the hopes of becoming major franchises) - i.e. Jaws: The Revenge (1987), Caddyshack II (1988), Son of the Mask (2005), and Deuce Bigalow: European Gigolo (2005) are but a few examples. Almost every film franchise has been included here, even The Rambo series, The Exorcist films, the Muppets films, the Pink Panther series, the Final Destination films, the Jackass films - and many many more, which fell below $300 million in revenue (as a series). However, it was thought important to include lesser franchise films (in terms of revenue), such as the Godfather films, Romero's Dead series, Raimi's Evil Dead films, and the Tarzan series (with Weissmuller and O'Sullivan), since all of them have had either longevity and/or unique appeal. In the cases of Home Alone, Rambo and the Jaws and Exorcist franchises, each film had a major blockbuster to start (Note: Rambo's second film was the big one), but then dropped off considerably with their next few sequels. Many of the biggest blockbuster film franchises have not received high marks for film-making quality either, with some exceptions (The Lord of the Rings trilogy, the first Shrek film, the first two The Godfather films, etc.). Some of the factors that have spelled the end of franchises have included aging stars, the high-salary demands of actors, accelerating expenses, unoriginal and unsatisfactory plot-lines and an over-reliance of CGI and special effects (the Star Wars prequels, for example), and the end of source-materials (such as in the case of the filmed Harry Potter books).